Does the move to independent publishing made you happy or sad? Actually, it sometimes makes me want to bang my head against the wall -- specifically, when I find really, really good mysteries that have been independently published in small regional ways, when I think the books are masterful enough to delight a national audience through an established publisher. Somehow it doesn't seem fair that there are TWO Vermont authors in this category just on my own reading desk! The first is R. A. (Robbie) Harold, who lives in the Montpelier area and whose Dade Wyatt series -- historicals set in the time of Teddy Roosevelt -- is now two books long and enjoyable enough that I always want to stretch out the reading time, relaxing in the hands of a terrific storyteller whose decades of dramatic performance feed into her immaculate pacing and scene-setting. Dade Wyatt is a sleuth I'd love to meet in person. While he reverses the truck to the launch, I huddle in the mothball scented blanket and continue shivering. The whole event feels surreal: could a simple stakeout go any more wrong? What are the chances that Miller would not only see us but pursue us? And if Sam is staying there, what are the chances I'm going to apprehend him on the property? I snort at this thought. T. R. Waters, Security Expert. Maybe instead my office door should say, T. R. Waters, Bumbling Idiot. ... Curses form in my head, but negative thinking and self-condemnation, while tempting, aren't going to change my situation. I am SO going to buy more copies. This goes on my holiday gift list, for sure. And as a collector, and as advisor to other collectors, I say: Get this book now. 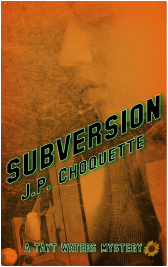 Because when -- not if -- J. P. Choquette moves away from "indie" publishing to contracts with the national publishers, SUBVERSION will be a rarity and you'll have a copy that shows you recognized her skill even back then (that is, now). Here's the gist of the book: Tayt Waters, providing security services in the hardscrabble town of St. Albans, Vermont, faces the drawback that whether the person she confronts is a police officer or a drug-peddling criminal, it's often enough someone who knew her in high school and who doesn't take her seriously enough. But Tayt is tough: working out nearly daily with a boxing bag, carrying a handgun, training assiduously with her mentor Judy, one of the state's licensed private investigators. And she's determined to make her security business a success, even though she has to raise some of her rent money by cleaning empty houses (foreclosed, or seasonal on nearby Lake Champlain). Plus, even the handicap of her off-kilter family (and everyone knowing about her past) doesn't stop her from operating an off-the-books support service for abused women, one that taps into both her creativity and her self-defense skills ... and oh yes, her rage against the unfairness of abusive fathers and husbands. She's got her reasons. From the start, Choquette whips Tayt into commitment to rescuing victims of injustice, in a totally understandable way that justifies the handful of errors in judgment that she makes -- not enough to be dumb, but just enough to remind us that Tayt's not yet experienced in the PI business and has a lot of distractions, including former boyfriends and odd neighbors. The pace is sharp and quick, the quandaries risky and tense, and the demands Tayt makes of herself kept me engrossed in the tightly plotted story. And if there was one twist that I didn't fully buy into, and one sentence that bothered me -- well, that's way fewer than most nationally published thrillers are likely to have. An impressive Vermont thriller, from a skilled and just-dark-enough author. Highly recommended. And don't forget -- when Choquette hits the nationals, you found her first. Here in Vermont. Thank you, thank you, thank you! What a wonderful review of 'Subversion,' Beth. I'm honored that you chose my book to read/review and appreciate being selected. Perhaps I'll tape my voice reading your words for those days when that little, critical voice is extra-loud. Thanks again! On my list for sure!